As a retailer it is difficult to run a cash only business, everyone expects to be able to pay by credit or debit card. When considering the move into accepting card payments there is a minefield of information to look out for, luckily for you I have created a small checklist to ensure you get the best price. I will also outline what a typical price you can expect to pay is, if you pay higher then shop around and change supplier. But before we get into what to look out for we should first point out some reasons a card terminal will be good for business, and why it isn't always neccessarily just making life easier for customers. - Customer Satisfaction - Your customers will be happy about being able to pay in card, no more quick runs across the road to pick up cash from the ATM. A customer that can use card payment will always be more popular than a cash only business, as cheques have been phased out of existence we can also expect to see a bigger reduction in cash usage. - Less Banking runs - Banking can be expensive, ordering your float each week and doing the daily bank run can become a chore, you will be able to reduce this frequency by moving to card acceptance. Depending on the average selling price in your shop you will find most transactions over £10 will be done by card, leaving you with only the small change float required. - Less fraud - Millions of pounds of fraudulant money is in circulation, passing from customer to shopkeeper unwittingly for years. Most commonly this is in the form of £1 coins. If you ever try to bank these there is no compensation, you can't expect to ever see that money returned. With the invention of Chip and Pin you won't have that concern, with any fraud being covered by your insurance. - Increase revenue - People spend more when using card, they more likely to make multiple purchases and having impulse buy products at the till is a good way to encourage this. A lot of small businesses begin by having a sign that charges for card use under a certain value, this also encourages impulse buys, but also will likely offset the cost of card usage on small profit margin products. - Improve Trust - A card machine presents a level of trust, a person is more likely to know you are not some dodgy organisation that operates outside the system. Having a card terminal proves you have a bank account and a decent credit history. 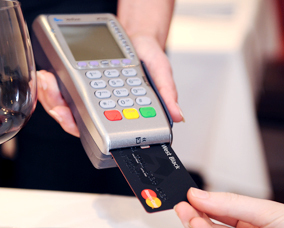 Debit Card Charge - This is always a flat fee regardless of the value of the transaction. Offered in pence you can expect to pay between 10p and 20p per transaction. If you mainly do this type of transaction which is likely for a business moving from cash only to card payments I would suggest you negotiate this down to around 11p. Credit Card Charge - This varies widely with a decent rate being around 1%, although in recession you can expect to take more of this type of card than you would during growth in the economy. I would say that to negotiate a lower debit charge you can allow this to go up to around 1.3%. Corporate Card Charge - If you deal with business customers then it is imperative you get the rate for this. Businesses often mistake this for being the same as credit cards, but you will find this rate is likely to be pre set much higher. Ensure that you ask and negotiate although if you don't sell to business customers then it will not be a problem. Monthly Fee - There will be a monthly fee attached to the rental of the equipment, this can vary from £10 to £40 and will depend on the type you need. I would always expect to pay below £20, and ensure that prices quoted are including VAT, an oft forgotten item when discussing prices. You need to understand the actual cost to yourself. 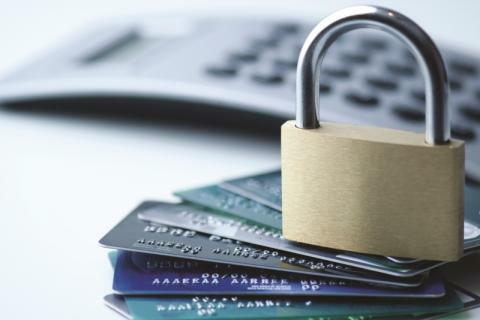 PCI Compliance - This is a term they try to confuse you with. Read here and understand what it means. Minimum Usage Fee - This is one of the hidden costs you may not consider but if you work on the assumption of how many card payments you would need to cover this each month it is a good basis to start. If they want to apply a £20 minimum usage fee then at 14p per transaction this would mean 142 transactions each month. If you envisage lower number of transactions then it would be worth accepting a higher individual charge but lower monthly usage fee. For instance if you average 50 transactions 20p with mimum usage of £7 is better than 11p with minimum usage of £15, the former costing you £10 and the latter costing you £15. Contract Length - Do not get tied into a contract that is likely to expire and cost you for reinstating this, ensure there are no hidden costs when this contract expires. Service and Reliability - It may seem a risk worth taking to go with a lesser known brand, however you may find support not available when you need it. It could also mean that equipment isn't replaced quickly and you are left with the problems of angry customers. Ask what their support facilities are, and also their replacement guarantee. Equipment right for you - You can run your payment terminal through the phone line or the internet connection, if your business needs to operate quick then the internet connection is best, however this can present problems depending on the speed and reliability of your internet connection. Phone lines are stable and reliable. You may be tempted to try one of these mobile phone attachment options as there is little set up costs with only transaction fees payable. Before you do ensure that you have researched the product and are happy with the limitations. Many do not offer full coverage of different cards, have temperamental technology issues, poor customer service and present an image to the customer they may not be happy with. Plugging their pin number into your mobile phone is not a great way to make a customer feel safe, so although it may work out cheaper, cheap is both applicable to price and image.